Help me MAKE it through this... please. Today, after dropping off my son at work and my daughter at school; before dropping off my husband at work, he informed me of a call the night before. The homeowner of the rental we are in needs us to move out of her house. We've been given until March 29 to vacate. Her explanation to us was that a friend of hers is getting a divorce and she has made her home available to this friend and her family. Now, my family needs to get out. When my family moved into The Place, it meant we would be under one roof together again. Our homeless period lasted a few short, but miserably stressful months, after two years jobless and anticipating foreclosure - I just learned recently that Chase bank was in no rush to take possession of our home as long as we were keeping it occupied and landscaped. Here (where we arrived after asking family members if they would take us in during our time of need) is where we would re-group, attempt restoration, and re-establish some semblance of normalcy for our downtrodden family. Below is an excerpt from A Home Not Our Own which give a glimmer of life at The Place. More will follow as I try to navigate the uncertainty that lies ahead in the next 4 1/2 weeks. Stay with me. Your support, encouragement, and best wishes are greatly appreciated. 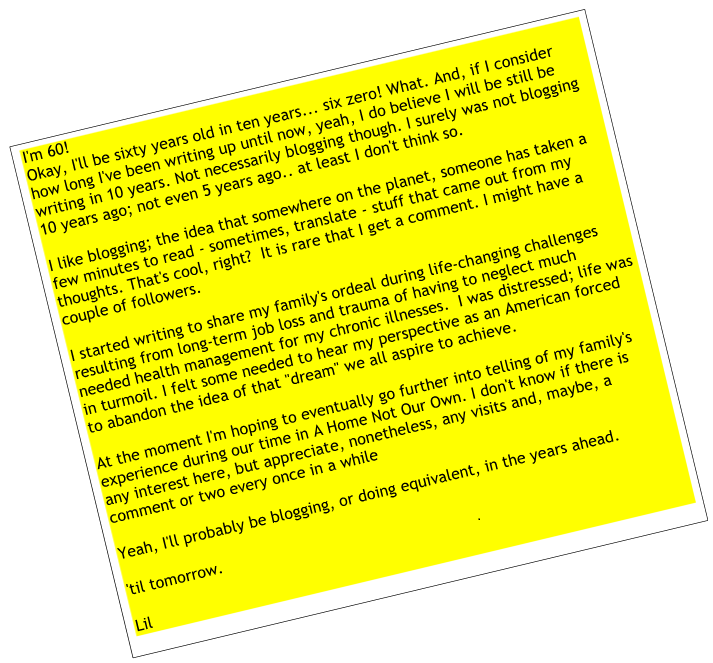 Tuesday, March 11, 2014: Do you think you'll still be blogging 10 years from now?